Q. 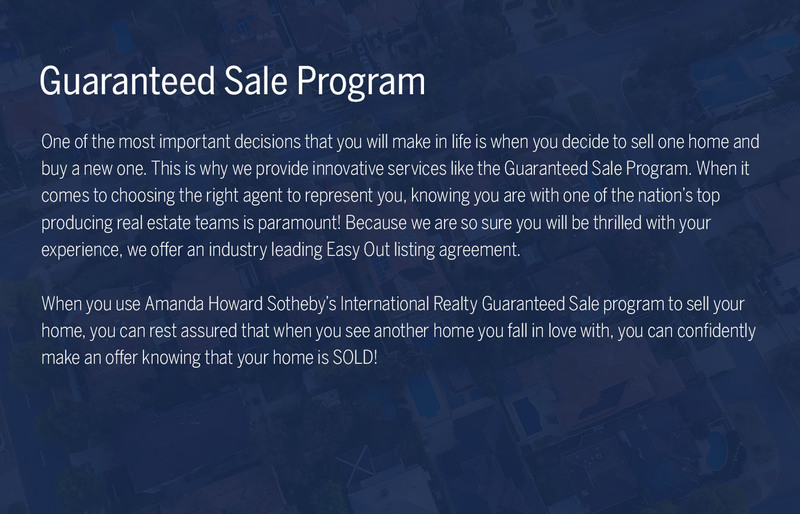 Does Amanda Howard Sotheby’s International Realty actually buy my House? A. YES Amanda will buy your house, or she will offer it to one of her outside investors for the same Guaranteed Sale price that was agreed to. A. When you hire us with the Guaranteed Sale program, you will know when and for how much we guarantee to buy your home if it does not sell within the agreed upon time frame. A. NO! It’s very simple… We will present you with the price and terms of the Guaranteed Sale Agreement before asking you to sign anything. * Some restrictions apply, this offering is not available in all areas.